Seeing as how I’m making this quilt pattern again, I figured I should share the dimensions of it as I go in case you want to make your own! 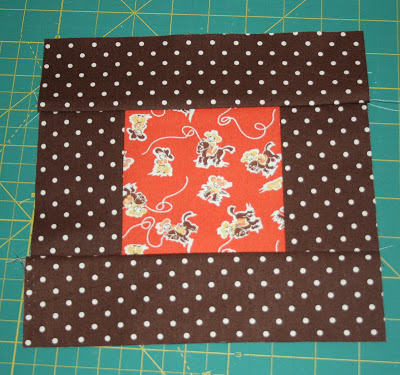 Sew 4 1/2″ rectangles to block, iron. This is a great and fast pattern for chain piecing! 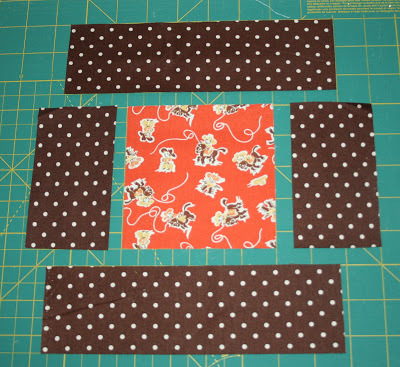 Sew long rectangles to top and bottom and iron. The final block is 8 1/2″. 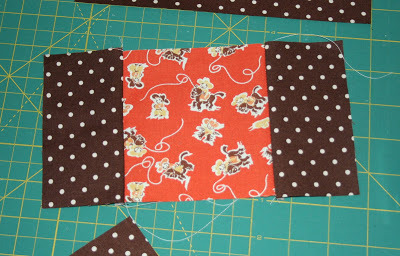 To make the orange and white quilt I made it 8 blocks acrossed and 9 blocks down, so 72 blocks total. 36 white border blocks, and 36 orange bordered blocks. ( 36 white squares, 36 sets of white strips, 36 orange squares, 36 orange sets of strips) It made it about 62″ by 68″. For my sons twin quilt, I am making it 8 blocks by 12 blocks, which will make it a perfect twin size. The twin sized quilt with this pattern takes roughly 6 1/2 yards or so of fabric. Happy Sewing! This is going to be just great! Can’t wait to see it all quilted and bound! This is really great to have the dimensions for this one! Thanks for sharing! That is the cutest cowboy fabric I have ever seen!! I love the quilt top too…very simple but great for showcasing that cute fabric! Thank you for the tutorial! I love this quilt! And thanks for the dimensions. I really love this quilt, it is so simple but gorgeous. I want to make a twin size one for my daughter. When you say it takes roughly 6 1/2 yards of fabric is that just for the quilt top and the binding and backing would be separate? I’m new to quilting am not totally sure how much fabric to order. Thanks for taking the time to comment Allison and answering my question! I have one more if that’s okay…I’m assuming you probably have a stash of fabrics that you used to make this quilt but you did say for your son’s version of this you collected fabric for months. Since I am just beginning in quilting I have no stash to speak of, so when ordering fabrics how much should I order of each? Maybe like a half yard of each fabric so that it totals 6.5? How many different fabrics did you use on your sons quilt? Oh and thanks for letting me know how much fabric you needed for the binding…I had no idea so much appreciated! I have some beautiful fabrics that I have my eye on for my daughters quilt, but didn’t want the fabric to get lost in the design. I think this quilt is perfect for highlighting the fabric itself. I just love it. Can you tell who makes the cute cowboy fabric? Thanks so much for the directions for this quilt! IT is amazing! Hey my cousin just told me about your blog. I love it. I am also just a beginner…actually I haven't even started! Yikes. I love your quilt, but I have the same questions Kindra had. So the 6.5 yards of fabric is for what pieces? Front, back, binding??? Also how much fabric for each? How many different fabrics. I really like the orange quilt. I don't need to do something on the back like you did with this aqua quilt, but the orange seems simple enough. I do want the twin size also. Help? Thank you so much. I have the same questions as Angela. Thinking about using this to make my sons twin quilt. I love this idea, and I love the one you just made out of Hunky Dory! I'd like to share a link to this tutorial on sewwhattoday.blogspot.com on April 25! I so love this quilt…I'm going to make one for a friend who is having a boy so i've got some great blue pattern fabric and then instead of white going to do a light blue in kona fabric….thanks again!! Blog nota 10!!! Gostei de tudo que ví, e estou aprendendo com os tutoriais. Felicidades! Abraços e beijos no seu coração. Deus lhe abençoe, proteja e ilumine sempre em todos os momentos de sua vida e da sua arte. Hi! I just wanted to let you know that I recently tried this pattern out for a baby quilt that I made for my boyfriend's new newphew, with awesome results! The pictures can be found on my blog http://www.miteredcorners.wordpress.com if you're interested. I love your blog so much! I get so much inspiration from your projects. Hi I'm your newest follower! Blogs like yours get me really excited about trying quilts and I'm so ready to making my first one! I'm eyeing a couple of your patterns to start off with! You are so talented!! love this quilt and all the free space feeling the white makes! 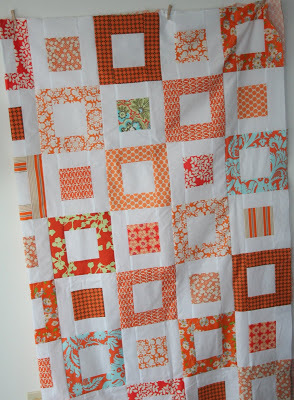 I love this quilt and I never like orange things! New to quilting, came across your blog, LOVE IT! :) I am interested in making this quilt for my fiance as a wedding gift/ comforter for our new home. Could you advise me on how to make it fit a queen sized bed? How to adjust the number of blocks etc. What is the best measurement to buy the different fabrics in? Feel free to email me @ amporter@ku.edu . Thank you in advance! I'm in love with the orange and white quilt. I'm thinking of making it. But I'm a quilting newbie, so I have questions: Would a charm pack work for this? Do you have any suggestions for an orange charm pack? Also, I'm thinking of buying a new sewing machine, which I would use for sewing, not final quilting. Any recommendations for a machine? The quilt looks amazing, I've not done much sewing yet, I'm in the middle of knitting a blanket but I really like the orange colours. really well and amazing work.